Here in the northern hemisphere, winter is here with a vengeance and you might be feeling frustrated with your practice. Maybe you only have an outdoor pool or transportation to an indoor pool is not possible right now. 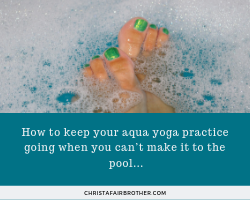 Here are seven ideas for how to keep your aqua yoga practice going even when you can’t make it to the pool. Borrow a friend’s hot tub. Hot water is really soothing and reduces pain. If you need some convincing about a hot tub’s benefits, read this article from Canada. Practice in the bath. Your bathtub provides a firm foundation for a lot of seated postures you don’t have the opportunity to practice in the pool normally. What does it feel like to practice butterfly or a seated twist in the water compared to on your mat? Working in warm water increases the range of motion in your joints. That can be good, but be cautious too. You might come to a new place in the posture that you’re not used to. Create a new sequence from your favorite book. I’m a Tolkien nerd, so just for fun, I’m working on a sequence with my favorite quotes from the book to inspire my practice. My Tolkien sequence is using my favorite quotes from the book to support my practice in new ways. Can you find new mantras or new ideas from your favorite novel? Fit your practice into your vacation. Are you sick of winter and have a tropical vacation planned anyway? Are you going on a family cruise soon? Strategize a way you can work your practice into your vacation. Pick a land pose you’ve never done in the pool and create a plan for how to do it in the water with three variations. Next time you make it to the pool you can try out your ideas. Use an ocean sound meditation to practice an aquatic meditation. If it isn’t beach weather where you live, but you want to meditate with the waves in person, pop in a CD and practice with some water sounds. I’ve used this ocean sounds CD before. Take one aspect of yoga philosophy and apply it to everything you do for a day. Maybe ahimsa, or being kind, is something you try and practice while you’re in the pool. What would it look like if you applied it to every aspect of your day? Would you eat better, go to sleep on time, not procrastinate on the job, or not grouch at your spouse? Yoga is something you can apply to your whole life, so you can always keep your aqua yoga practice going when you can’t make it to the pool. If you need help with your aqua yoga practice join my Intro to Aqua Yoga online group course that opens April 4th. Subscribers to my email list receive early bird perks and discounts which include a 20 minute private session with me.